I hope you enjoyed the "Trix"ster Treaters I posted last week. I think they were adorable, but as you all know I am a chocolate peanut butter person so this week's post it more my taste. This trifle is for all the chocolate peanut butter lovers out there. Layered with moist brownies, rich peanut butter mousse, and crunchy Reese's Puffs, this dessert is not for the faint of heart. 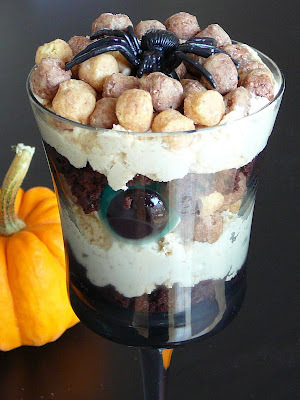 This trifle incorporates an element of terror for your guests when they dig in and find a gummy work or eye ball mixed in with their mousse. Prepare Betty Crocker Original Supreme Brownie Mix as directed and let cool. In a large bowl, beat together the cream cheese, peanut butter, and confectioners' sugar until light and fluffy. Set aside. Divide brownies, peanut butter mousse, and Reese's Puffs Cereal into thirds. In a trifle dish or large bow, layer one third of the brownies followed by the peanut butter mousse and the Reese's Puffs Cereal. Place assorted candies in between layers making sure they are visible from the outside of the dish. Repeat layers two more times, finishing with Reese's Puffs. Decorate top with remaining Halloween Candies.